To mark the 50th anniversary of our Toulouse site, we held round tables on the theme of the Future of Mobility, one focused on self-driving mobility: a society revolution, and the other on smart cities. 12 industry experts from companies such as Renault, Airbus, Continental, EDF, Orange, Valeo and NXP were split across the two panels, that were hosted by the tech aficionado Anicet Mbida, journalist for Europe 1. What follows is a recap of those discussions. The discussion for the future of mobility centers around changing societal values rather than the technology that will enable it. The need for more autonomy is accentuated by the movement to make our roads safer and reduce fatalities. Using the technology that we already have today to sense our environment can be re-used to help prevent collisions, or other critical situations where human drivers cannot react as fast. In fact, Guillaume Devauchelle, Vice President of the Innovation group and Scientific Development at Valeo, says that the technology needs to be transparent. Drivers don’t want or need to know about what technology is there, they just want to be connected and feel safe on the road. This means that the technology has to be ultra-reliable. 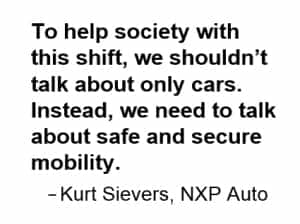 Kurt Sievers, Executive Vice President and General Manager for Automotive at NXP, says mobility is being redefined. To help society with this shift, Sievers says we shouldn’t talk about only cars. Instead, we need to talk about safe and secure mobility. Through industry collaboration, we can replace the human driver with technology. It requires an array of different sensors to achieve the same level of perception, but the upside is that the technology will be more accurate than human beings – seeing around corners, through fog or over a hill, for example. Furthermore, our cars will transform into a learning system with artificial intelligence – teaching the vehicle to learn from the environment in the same way that a human driver is able to learn. The final piece to the story is “actuation,” when the vehicle knows when and how much pressure to brake, or to turn left or right without a cue from a human driver. Actuation must be perfected – from the human brain into the physical electronics world. That is what makes the whole system so powerful, according to Sievers: being able to bridge back and forth between the real, physical world and the digital. The late Mark Rich, Vice President of Connected Fleet in the CTO office at Airbus, agreed that sensing and processing is important, but interaction is potentially more so. In the aviation world, there is much more interaction between the pilot and the vehicle than in the transport vehicle world. So, communications and the types of communication that exist today are clearly going to be necessary to enhance this automation capability. Network capabilities will make the prioritization of services to the autonomous car a key point according to Julien Masson, head of connected car at Orange. You want the vehicle to be able to prioritize and notify you of critical issues, rather than giving bandwidth to infotainment for example. So, what’s really needed is investment in the infrastructure and also widescale collaboration to be able to beat cybersecurity threats. Being able to protect the vehicle to different levels of cybersecurity is one point, but how it is embedded into the infrastructure is equally as important says Sievers. Moving beyond the question of cybersecurity, is the question of responsibility. Alexandre Corjon, Global Vice President of Electrics, Electronics and Systems at Renault says that the grey area over who is responsible is resolved by technology. Technology will make sure that we are able to protect the driver continuously, that there is no risk of the driver thinking that the vehicle is in control and taking the right decisions, when suddenly it can’t do it. As Adrian Traskov, head of chassis and safety IC solutions at Continental explains, being able to apply the same level of testing to the autonomous car as traditional car platforms today, is just not possible. For a vehicle to be released today, it is tested over millions of miles to get the confidence that the systems function. These systems become much more complex in the future and will require billions of miles to get the same level of confidence. So, what will happen is real users will effectively be the testers. Data will be aggregated from a whole fleet of cars, to be processed together, to allow a function by function release over the air to the entire fleet as each function is validated, so enhancing the experience with each step. So, the whole network needs to be secured – this is a huge infrastructure problem. We can learn from the aerospace industry though, since one of the key crossovers between automotive and aerospace industries is functional safety. There is a major difference between what is in operation today between the two, according to Masson. Planes have a much higher level of functional safety with redundancy levels. In addition, air traffic controllers add a layer of human operation, which will not exist in the fully autonomous car, since this will rely on AI. Rich added that the autopilot function does involve a human aspect, which is learning to let go of the controls. The human element is really the hinging factor for Sievers; as the industry moves through the gradual process of automation, we’ll get to a blocking point for most people around level 3- because although the driver is off action because the autopilot is activated, the driver still has to pay attention because something may happen that requires their attention. Sievers believes that drivers can’t function properly like this, they are either fully on, or fully off. Which is why he suggests this leapfrog movement, to move directly to a level 5 system to tackle the mogoogre difficult end of the spectrum. The question of autonomous vehicles and the required enabling infrastructure has its importance within the smart cities of tomorrow, too. Traffic congestion, pollution, parking facilities, building development and transportation of goods and services are concerns shared by city planners. The timeframe to move towards more connected and secure cities must be aggressive. Solutions must be standardized. Christophe Fourtet, Founder and Scientific Director at SigFox questions how do we get the right information about the right infrastructure. The information that we collect today is not nearly pertinent enough to build the infrastructure that we will need tomorrow. We need to have better connectivity and integration for the infrastructure to be more developed – as the way that people live their lives is changing. 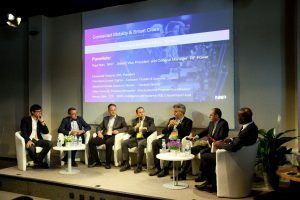 There are increasing numbers of people who no longer travel to an office to work – instead opting to work from wherever they are able to connect, from their home, the coffee shop and even the airport lounge says Paul Hart, Senior Vice President and General Manager of RF Power at NXP. The key challenge ahead of us is to be able to provide this level of connectivity and provide the fast data rates everywhere as needed. This will give us the ultimate flexibility in how we work, how to coordinate all the different pieces of the smart city that need to be integrated. One way that this could function is through collaborative platforms that puts citizens at the heart of information sharing and overlays data analytics capabilities to data that is collected by groups of individuals to create a solution for a different type of usage. There are many examples of these collaborative navigation applications already in use today, but likely we will be seeing more and more of these civilian citizen systems, that will mesh together to create a new smarter city dynamic, according to Stephane Gervais-Ducouret, General Director at Neavia. The challenge here, Hart said, is that anyone can look into the future and dream about what it should be like. What’s really difficult is for us to look into the future, dream and get it right. Getting it right means creating an infrastructure that will enable self-, organic development from both citizens and industries. In the end, innovation of our cars will inspire amazing features that we haven’t yet conceived. These same innovations will make our future smart cities secure, usable and interactive. In late June, these key industry leaders gathered for a VIP event held at NXP Toulouse to celebrate its 50 year anniversary. Back in 1966, the Mayor of Toulouse announced the construction of the Toulouse site as one that would spark huge development in the region and make Toulouse a technology hub for the future. Fifty years later, the statement rings true: Toulouse is a hotbed of start-ups and R&D centres for the automotive and aerospace industries.